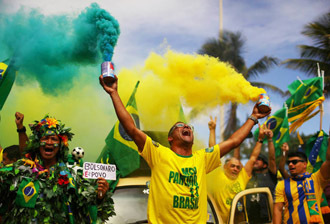 Former army captain Jair Bolsonaro was elected president of Brazil on Sunday, promising a fundamental change in direction for the giant Latin American country, rejecting by wide margins Leftists’ lies, duplicity and corruption. Bolsonaro managed to tap voters’ deep anger over crime and economic malaise. Official results gave the president-elect 55.13 percent of the vote in the run-off election, to 44.87 for leftist opponent Fernando Haddad, with 99.99 percent of the ballots counted according to AFP/Yahoo. 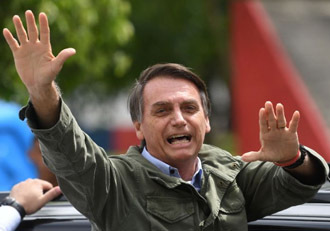 Bolsonaro, 63, will assume office January 1 and pledged, “We will change Brazil’s destiny together.” His victory speech was broadcast live on Facebook, the platform he has used to campaign since an attacker stabbed him in the stomach at a rally on September 6. But he promised to defend “the constitution, democracy and freedom,” fending off opponents’ warnings he would try to veer toward authoritarianism. 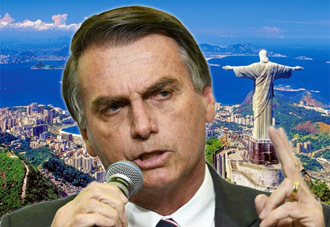 “All these people here are outraged, upset about corruption and crime, and we are with Bolsonaro. The people have spoken. For the first time I feel represented,” said Andre Luiz Lobo, 38, a businessman who — not incidentally, given the accusations of racism against his candidate — is black. On the other side, the reaction was despair — and a defiant vow to resist. Sound familiar? Haddad, a former Sao Paulo mayor, said he would fight to “defend the freedoms of those 45 million people” who voted for him, after Bolsonaro vowed late in the campaign to “cleanse” Brazil of leftist “reds.” Aides said Haddad, 55, had not called Bolsonaro to congratulate him. “Fascists!” shouted tearful supporters at the headquarters of Haddad’s Workers’ Party in Sao Paulo. “I’m surprised Brazilians would vote for hate, for guns,” said Flavia Castelhanos, 31, after wiping away her tears, wearing a pin that said “Not him” – opponents’ rallying cry against Bolsonaro. 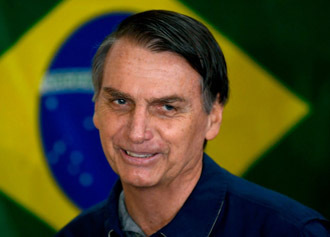 The environmental group Amazon Watch warned Bolsonaro — who has vowed not to let conservation programs interfere with agro-industry — “spells disaster for the Brazilian Amazon.” Click here for more from Yahoo.com. This entry was posted in National on October 29, 2018 by admin.